On a cold frosty morning in a cabin situated on Knife Branch, Wyoming County, West Virginia about the year 1897, little five year old Noah Smith was at the kitchen window, very patiently watching the patch of sunshine on the top of the mountain 700 feet above the valley floor. He knew quite well, that he would not be allowed to go out to play until the sun had risen high enough to melt the frost in the valley. As he waited and watched, he drew little squiggles and worm tracks across the frosted windowpanes. He knew that it would be at least two hours before the sun would penetrate the steep wooded hillside and warm up the valley. His mother Emily was busy at the kitchen stove trying to prepare breakfast for his older sister Delilah and his two older brothers, John and Floyd. There was also a baby boy Mathias, just a few months old. Noah really didn't know if his dad, Allen, was home or not, since he worked for other farmers and was frequently gone from home for long periods of time. This was wintertime and his father working as a farmer, made the chance for a big wholesome breakfast very slim and it must have been a challenge for his mother to provide the basic needs for existence. This pattern of living was evident for approximately the next three years, when in Feb.1900, another baby brother was born and they named him Riley. Grandpa Allen was home at least part of the time because dad has told me of occasions when he would sit out on the front steps and scratch his daddy's head, a ritual his dad must have enjoyed very much. Allen sold a tract of land on Brier Creek that he had inherited from his father. Soon afterwards, around the last of 1900, Allen just seemed to have disappeared. No record of his death or divorce has been located thus far. Grandma Emily sold the place on Knife Branch and apparently went to McDowell County to live. Family notes have indicated that The Ritter Lumber Company, in logging operations, knocked the pillars loose from grandma's house and forced her to move. What happened next in dad's life is shrouded in mystery, too. After about a year, grandma Emily had to spend several months in the Poor House in Welch, West Virginia and her family was split up. She was only able to keep Riley, since he was so young. Dad was sent to Hillsville, Virginia where he spent several months with a family named Allen. Dad has talked to me on numerous occasions about his life with the Allens. That period in dad's life was so happy that it left him with pleasant memories for the rest of his life. He would tell me how pretty Mrs. Allen was, with her long black hair hanging down her back and how beautifully she could sing and play the guitar. Her favorite song must have been "Bury me Beneath the Willow," because it was dad's favorite too. Other songs he learned were "Barbara Allen" and "Maple On the Hill". He learned a few chords on the guitar when he stayed there. As a matter of fact, had dad not been so young at the time, I would have to say that he fell in love with Mrs. Allen. Quite a lot happened to grandma Emily while dad was in Hillsville. She went to Pineville, West Virginia probably to find work, met and married a man by the name of Jackson Farley but the marriage didn't last long. In a search for her divorce, I discovered that Jackson Farley had been married and divorced no less than eight times. Grandma's divorce was a sordid affair in which she was accused of being a whore who had slept with negroes and every other man in town. Farley's witnesses, his lawyer and the judge were the same ones who had participated in all of his previous divorces. The trials were almost identical in every respect. Even though the complete divorce proceedings are a matter of record, no transcript granting the divorce was ever discovered. Grandma Emily, I believe, went back to McDowell County for a short time after her divorce. Dad was probably fourteen or fifteen years of age when he left the Allen's in Hillsville and went to Pageton, West Virginia, where he took a job as a trapper boy in the coal mine. These fairly easy jobs were usually assigned to young boys just entering the mine for the first time. Dad soon proved to be too talented and ambitious to remain a trapper boy. He was soon to show himself as an outstanding man among men in the coal mines. A veritable giant whose skills and knowledge of practically every facet of coal mining would allow him to pick and choose where he wanted to work and at what job he desired. Most coal miners spent their entire life at the same job throughout their coal mining career. They were either coal loaders, cutting machine operators, track layers, or any one of dozens of other jobs outside or underground. My dad could do them all. In just a short while the family, consisting of Emily, dad, Mathias (who was later nicknamed Tice), and Riley was reunited at Pageton. Delilah had died and Floyd was on his own, working in a mine in Kentucky. 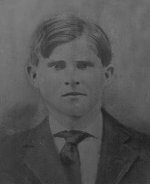 John H. went to Covington, Virginia in 1907, married and settled there. Dad never mentioned Uncle John and I doubt if he ever saw him after he went to Virginia. Dad rented a house in Pageton next door to a boarding house which was managed by James and Mollie Rose. The Roses were to play a very important role in dad's life because there was a pretty young widow by the name of Laura Harmon in the family that dad took a fancy to. Laura was the daughter of Mollie by her first husband. In just a short while my dad was a married man. The marriage took place in Welch on June 9, 1910. Laura had two children from previous marriages and with dad's family of four, he surely took on a lot of responsibility for a young boy of seventeen. Two women in one household are bound to cause trouble, and so it was with mom and Emily. Whether it was jealousy or whatever the reason, trouble brewed to a boiling point. I believe that one could have killed the other if the situation had continued. I have heard my mother say that Emily was crazy and had threatened her with a butcher knife on several occasions. It is conceivable that grandma Emily had been tormented with misfortune to a point that it had actually caused her to have a nervous breakdown. At any rate, dad made the decision to have her committed to the State Hospital in Spencer, West Virginia in June 1911. She died there of pneumonia on November 10, 1918. In 1912, dad and mom were living in Blackwolfe where Nellie was born on January.7. Next, they moved to Cambridge (later called Fall River), where Kathleen (nicknamed Tellisile), was born on July 29, 1914. Olivene was next, being born on September 25, 1916. and died on July 16, 1917. Cambridge was now called Fall River and I was born there on June 3, 1918. Dad said that I kept him from having to register for the draft for World War I and I kept him out of the war. May 11, 1919 was a sad day for dad. He was working close to Tice in the mine at Shabby Run when a huge piece of slate fell and crushed uncle Tice. Dad rushed to him and held him in his arms until he died. Dad never completely got over Tice's death and some how blamed himself for his death. It was about this time that dad and mom decided to move out of the coal camp at Fall River and moved into a small house in Roderfield. This house was the first one that I remember. I recall visits from Uncle Zur (probably Isaiah) and Aunt Surry (Sarah). Herbert was born here on September 23, 1920. Our house was situated on a sloping hill above the railroad where they parked the shanty cars for the railroad workers to live in. I remember going down to the railroad and being treated to candy bars by the workmen. One man I distinctly remember was named Wash Rose. He was the blacksmith and worked on a flat car with his forge and all his equipment. I believe he was distantly related to my grandpa Rose. Dad was working in the mine at Fall River, but he let the Superintendent, Bill Little, talk him into going to Kentucky to open a new mine. Dad was accustomed to making his mind up on short notice, but I believe this was one of the worst decisions he ever made and I'm sure he lived to regret it. He loaded our furniture in a box car which had been placed on a railroad siding below the house and he loaded us on a train and we headed for Kentucky. We had to stay overnight in St. Paul, Virginia in order to make a connection for the train to Pineville, Kentucky. We arrived in Pineville and had to stay with Mr. Little for a week until a house became available for us to move into. The house they were building for us in Tee Jay where the new mine was to be located, would not be ready for several weeks. Meanwhile, we were moved into a rental house in Varilla to wait until our house was finished at Tee Jay. The rental house at Varilla was large and was situated on a rather steep hill across the Cumberland River from the highway. I remember a very large company store being located on our side of the river, just above the railroad. There was only a swinging bridge connecting us with the outside world. While we lived here, there was a world of toys available for me to play with. The next door neighbor was a concrete finisher and had dozens of tools with which he let me play. I had a ball with his trowels and smoothing gadgets. Trouble is, he needed them from time-to-time and I was left to play with anything I could scrape up. A horrible accident occurred while we were living in Varilla. It was wash day and the usual tubs of wash water were in place on the big back porch. Herbert was about 2 years old and he had the dipper we used for drinking and was dashing it in one of the tubs of water. Now dad was known on rare occasion, to lose his temper for short periods of time and I guess he had grown impatient trying to get Herbert to stop. Dad grabbed the dipper handle and jerked it away from Herbert, but what he didn't know was that Herbert had his forefinger on his left hand run down the end of the dipper and out the hole in the handle used to hang the dipper on a nail. As dad jerked the dipper away from Herbert, it cut the tip of that finger off. Herbert still carries the scar from that incident. Time passed on, and our new house was finished in Tee Jay. It was moving time again and in a week or two, we were settled in our new home. The house was small with two bedrooms, a front room, kitchen and a small pantry. It was situated on the banks of the Cumberland River, not over 100 feet from the river's edge. Directly in front of the house was a sort of a wagon road and across the road were the railroad tracks. They were opening the new mine down the tracks about a half mile from our house. Up the tracks, about a half mile was the railroad station. There was a swinging bridge (they had a lot of swinging bridges in Kentucky), across the river in front of the railroad station that led to a small store and a cluster of houses across the river. I well remember crossing the swinging bridge, to either get a bag of candy at Thompson's store, or in company with one of my older sisters, to visit a farm house to buy milk and fresh country butter. It was here that Marie was born on April 21, 1923. The flu was rampant then and many people were dying as a result. I can't remember if we ever had a doctor to visit us during that ordeal, but we came through it OK. Dad and mom had to catch a train and go to Pineville to shop for food and clothes. They would buy barrels of dried peaches, pears and apricots, a barrel of flour, 50 pounds of lard and a crate of eggs. It all had to be brought back to Tee Jay on the train and carried from the railroad station to our house. No doubt about it, we ate well. About this time, dad bought a player piano--of all things! and I believe we only had one roll called "Crazy Waters", which we wore out. With our lack of room in that small house, it was almost unbelievable that dad would have bought a big piano. Needless to say, it didn't stay very long. Mom was rid of the piano in no time. We experienced several floods during the months we lived there and the floodwaters came up to our back porch more than once during that time. As a matter of fact, the floodwater plus the isolation from civilization may have been the thing that triggered mom's determination to move back to West Virginia. I'm sure, she and dad had many unfriendly conversations about continuing to stay in Kentucky. I don't believe mom had the first day of real happiness since they left West Virginia. At any rate, the decision was made to move back. It was about this time that Obra had fallen head over heels in love with the son of the Sheriff of Bell County, so she and Floyd Day were married on August 26, 1923. The move back to West Virginia was accomplished without fanfare, leaving Obra behind. We were now back at Fall River, West Virginia, settled in three rooms of a big duplex house that had water standing two feet deep under the house. Talk about a pneumonia hole, this place had possibilities. We, literally, had to walk on planks from our door to dry ground. But fortunately, we didn't have to live there long. A much better house became available across the road and we moved over there. Boy, were we ever experienced in the moving business! Mom was really enjoying herself, being back home close to her mother and all her friends. Dad as usual, had a good job and bought a big car that afforded us luxuries we had never experienced before. Every Sunday in the summer time, we were loaded up in the big old 12 cylinder Studebaker, with a large picnic basket and a watermelon, headed for Baileysville on the Guyan River, for a day of fun and relaxation. On arriving in Baileysville, dad would drive up on the hill above the bridge and park in a grassy flat. We kids would grab our bathing suits and head for the bathhouses to change clothes. Dad would usually stretch out on a blanket and take a nap, while mom was content to just sit on the blanket and watch after the small kids. After napping, dad would skate a little. There were numerous concessions around which included a wonderful skating rink. About two o'clock, hunger pangs set in and the kids headed for the picnic. Mom had the dinner spread out on a tablecloth and we kids gathered around and started eating. Boy, was that good eating!! We generally started off with boiled ham or pimento cheese sandwiches, followed by boiled eggs, potato salad, banana pudding and coconut cake. After a reasonable waiting period, we kids hit the Guyan River for another quick swim. (It was definitely a no-no, to go swimming on a full stomach). We changed our clothes and reported back to the car for a big chunk of watermelon. This about concluded a typical Sunday at Baileysville, and I don't have to convince anyone that we kids were pooped out before we were five miles on the road back home. As I stated before, we were experiencing some of the good life for a change. We owned the only electric washing machine in town, one of the very few who had a telephone and dad had bought a new set of wicker living room furniture. But bad things will happen. Dad had his hand lying on the top of a mine motor and a three- cornered piece of slate fell and severed his ring finger on his right hand and he was out of work for several weeks. It was about this time that we had another addition to the family, a baby girl Anita, born on August 24, 1925. This was to be the last one for a while. Dad, for some ungodly reason, engaged in a road race from Roderfield to Davy with the Superintendent's son. Dad was running his big Studebaker and somewhere above Davy, he went over the hill and tore his car up pretty good. The other guy's car caught fire and burned up just below Davy. I remember them towing what was left of our beautiful car in to the yard at Fall River. I don't remember what he did with the remains, but mom framed his picture in the aluminum frame that came from the rear of what was left of the cloth top It hung over the bed for years and may still be somewhere in the family now. I am sure that dad caught the devil for that prank. I don't think we owned another car for quiet a while. Soon afterwards, dad enrolled in a correspondence school, The Chicago Motor Training Corporation and took a course in automobile repair. He finished the course in record time and mastered the art of repairing all kinds of motor vehicles, including motorcycles and airplanes. Dad studied his lessons in a large grassy area down at Spice Creek. He would take Herbert and me with him and would park the car in the shade under some crab apple trees. Herbert and I would play while dad did his lessons. This was a beautiful and serene area to concentrate. It was the old homeplace of Grandma O'Neal whom, I think, was the mother of my Uncle John Rose's wife, Becky. Herbert and I played in the old house and climbed apple trees, while dad studied his lessons. Well, dad got good enough to start a garage in an old empty house in Fall River and solicit business. He had a gas pump installed and it was my job to sell gas. Dad worked on a car or two and overhauled a couple of motorcycles, but his business didn't bring in the money that I'm sure he had hoped for. Needless to say, this venture didn't last long and dad closed shop. There was a family by the name of Walls who lived just across the road from us about this time. They had a big old boy named Melvin. Melvin, who was at least 20 pounds heavier than I, was beating the tar out of me for some reason when a boarder, Mrs. Walls brother, pulled Melvin off of me, gave him a swift kick and sent him home. The boarder's name was Ray Gills. When he went back over to the Wall's, his clothes had been gathered up and tossed out into the road. Now it so happened, that Obra and Floyd had moved from Kentucky into a house beside the one in which we were living, but they had returned to Kentucky for some reason and Ray was able to rent a bedroom from them. Ray hired me to build fires, heat his bath water, and keep the place tidied up. Eventually, Floyd and Obra came home and Ray moved in with us for a while. Ray and Hazel took a liking to each other and so they entered the bonds of Holy Matrimony on August 3, 1928 and went housekeeping a few houses up from us. It was about this time, that dad decided that he wanted to quit the coal mine and try for a better life in the business world, so he leased a large metal garage and five room house in Roderfield. It was moving time once again! The garage had at least 10 cars in various stages of repair, so dad had his work piled up for him to do. I'm sure that dad spent hundreds of dollars just for parts to repair the cars, not to mention the long hours of labor. But few ever came to claim them and dad wound up with a garage full of cars that nobody wanted or otherwise, the owners couldn't afford to pay the repair bill. Dad had to get the Sheriff to auction the cars off at a fraction of his investment. It was another bad adventure in dad's life that he seemed to recover from rather quickly. In the meantime, things were beginning to get tough in the coalfield. Fall River, as well as dozens of other coal companies went bankrupt and suddenly there were hundreds of people without jobs. It was in this environment that we moved back to Fall River in a nice five-room house up next to the Big Rock and our old swimming hole. We lived in this house for about six months and when the former store manager's house became empty, we moved two doors down beside grandma Rose. We had it made at last! This house had a bathroom, running hot and cold water, a garage and most of all, a hot house where mom could store her flowers in the wintertime. Trouble was, dad was out of a job for the first time in his life and he was hunting everywhere for work. How well I remember a trip that dad took me on about this time. We climbed on board his big Harley one morning with me in the Buddy seat and set out for Home Creek, Virginia. Dad had heard that the little mine over there was hiring, so he was going to check it out. Boy! what a trip! We had hard top as far as Panther, but the road from there up Panther Creek definitely wasn't an Interstate. There were rocks in the road as big as basketballs and hills that dad had to speed up in order to climb. It was on one of these hills that dad failed to dodge a large rock and I was thrown about five feet up in the air. By the time that I came out of orbit, dad was two hundred feet up the road and he dared not slow down because that Harley would surely have given him trouble on that steep hill had he stopped. Dad went on to the top of the hill and I had to walk a half- mile to catch up. We eventually made it to Home Creek and dad found that the rumor of work was false. While we were at the mine, a heavy rain shower came up that made the road down the other side of the mountain pretty slick. Dad elected to start the motorcycle by drifting and letting out the clutch while in gear, a very common practice that was used when on a hill (it saved having to crank the engine). Trouble was it didn't work too well in an inch of slick mud. When dad let that clutch out, the rear end of that Harley skidded and headed for the side of the road and turned over. Had it not been for the steel stirrup in which I had my foot, hitting a large flat rock and holding that motorcycle off my right leg, I am convinced that today, I would be a one-legged individual. The rest of the trip home was uneventful. We went on to Grundy, up the Lee Highway, over the Jumps, to Amonate, War, Premier, and home. Dad wasn't much for charity but he did get a job with the WPA. The WPA was one of President Roosevelt's recovery programs administrated by The Works Progress Administration. It was also known as The "We Piddle Around" program. The job was digging roadside ditches on Hensley Mountain. Dad, also, didn't take too kindly to digging ditches so he threw down his shovel, walked down to the Hensley mine and of all things, got a job building bank cars. Ray, in the meantime, found jobs down at Krollitz, running a coal cutting machine. Krollitz wasn't a very big operation, and was located about 25 miles down Tug River from Fall River. Ray and dad drove that distance to work for about two months when dad suffered another trauma. He was guiding a steel rope onto the drum of a cutting machine, when a burr on the steel rope caught the index finger of his left hand glove and crushed his finger so badly that it had to be amputated. Dad drew a small workmen's compensation check for a while, which helped us over the hump. Dad always said that we ate his finger during this time. Dad was doing OK repairing a car now and then and so on this particular day I was helping dad work on someone's car and he needed a small Rumford baking powder can to replace the cover on the oil filler spout which was missing. He sent me off to search everybody's garbage dump to try and find one. I was 13 at the time and old enough to sense something was not quite right. Dad was extremely grouchy and hard to please. After I had searched all the garbage dumps without success. I came back empty-handed. Dad really blessed me out and sent me out again with instructions not to come back until I had found that can. This time I was successful because I dug deeper into the trash dumps. It was not until late that evening that I found out what dad's trouble was. The date was June 16, 1931, Shirlie's birthday. He was to be the last one. Within the next year, Dad and Mom lost 2 more girls out of the family. Nellie married her old schoolmate, Cecil Clagg, on March 17, 1932 and, barely 2 months later, on May 5, 1932, Tellisile married Sheldon Coffman, who was in the Army. Nellie and Cecil started housekeeping at Big Sandy and Tellisile went to Ft. Benjamin Harrison, Indiana to begin her life in the military. Sometime in the next two years, dad got a job as Night Foreman at Premier. I can't remember how he commuted to work, because I don't believe we had a car at that time. Dad managed to buy a lease from a man who was leaving Premier. The company had built houses on land outside the coal camp and leased them by the year, rather than renting them by the month. It was a big house with five rooms, two bedrooms upstairs and one bedroom, dining room and kitchen downstairs. The house was in terrible shape. There were no windows in one of the upstairs bedrooms where Herbert and I slept. Sometimes we would wake up with snow on our blankets and the floor. No electricity was ever installed in the house, so we had to use oil lamps for lighting. Dad installed an electrical line from the Indian Creek mine around the hill for half a mile, wired the house and we now had electricity. The line was so long and the wire so small that a lot of the voltage was dropped in the line and our lights were dim. Two rooms downstairs were heated with coal grates, but the upstairs was unheated. We carried water from a spring down below the house. Boy! the first couple of winters were tough, but we survived. Dad helped me build a run-about out of an old Chevrolet car. We cut the rear half of the body off and built a wooden bed on the rear. This was our only means of transportation to town and to the company store in Premier to buy food. We had about an acre of land, so we raised a big garden, bought a cow and had a pig. Things were slowly improving over on Indian Creek. I was 18 years old and started working in the coal mine as a backhand with Uncle Riley loading coal. First thing I bought was a 1937 Plymouth, 4-door sedan. Next, I bought lumber and built a garage down below the house. One day, a bunch of dogs gathered at our house to make love to our female dog. Dad was upset to the point where he vowed to shoot them all. He ran out on the front porch with a loaded shotgun and blasted away at the dogs. What he failed to consider was, that the dogs were passing by the garage about the time he let go with a load of number 6 shot and peppered the whole side of the garage. The car was in the garage and everywhere there was a crack between the boards, one can imagine the result. I married Lillian Elledge (nicknamed Bill) on October 4, 1938, turned the Plymouth over to dad and moved into a house in Premier. In October 1945, in anticipation of retiring, dad bought a house in Montcalm, West Virginia. They moved there from Indian Creek. It was a big, two-story house and there was a chicken house with 4000 chickens in the deal. Since Dad wasn't too fond of chickens, he got rid of them and made a garage out of the chicken house. Dad continued to work at Premier and drive from Montcalm every day. Herbert was living in Montcalm at the time, so he went to work at Premier and rode the long trip with dad. One morning on the way home from work, dad had an accident and tore the Plymouth up pretty good. He bought another car from Floyd Day and in a short while he hit a darn cow in the road and wrecked that car. I do believe that dad’s reflexes had begun to slow down a little about this time. Having no transportation, dad went to board with Nellie and Cecil at Premier. Cecil was General Mine Foreman there at the time. I think dad became dissatisfied with this arrangement and was getting pretty tired, so he retired from his job at Premier in 1947 and went home to settle down. Herbert was able to get a house in Premier, so he moved his family down there from Montcalm. Dad never completely retired. After a couple of months loafing, he tried to revive his coal mine activities and went to work at Goodwill, a very small mine near Montcalm. He tried loading coal in a 28 to 36 inch coal seam and found out soon enough that he just couldn't do it. From then on, dad was forever searching for something to keep him busy. He started in on the house, adding another bedroom and a bathroom upstairs. He overhauled the steam heating system, dug a well and installed a pumping station in the basement to keep it dry, and he must have spent close to a thousand dollars trying to get TV that was worth watching. He installed several hundred feet of "Johnson Line", connected to a Yaggi antenna up on the mountain behind the house and at best, the picture that he was able to receive, was so snowy it gave me a headache to watch it. Dad was pretty proud of his installation and I don't care how long it was between visits, he stopped everything to watch "General Hospital" or "John's Other Wife". He dearly loved his soap operas. Every morning, dad was the first one up. When I was home, I would get up and go downstairs, knowing that he was always at the kitchen stove eating his oatmeal. We would talk about how he was enjoying his retirement, his planned projects, and just about any other subject that came to mind. He never complained about anything, but he mentioned to me that he wasn't feeling too well. He had been seeing his doctor quite regularly and had his check-ups on time. He said his stomach bothered him quite a lot. His doctor and about everybody else dismissed his symptoms as upset stomach or a touch of heart burn, but about two weeks later, his doctor decided that his trouble was a little more serious and admitted that he had a mass or lump in his stomach. Dad was taken to the hospital and immediately scheduled for surgery. The result was devastating: a malignant pancreatic tumor, which could not be completely removed. I don't remember the prognosis but it wasn't good. They discharged him in about a week. We, literally, tried every where to get dad in a nursing home or nursing care center where he could be treated for pain, but none was available, so we set up a bed in the living room downstairs and the girls tried their best to take care of him there. Bill (my wife) and Jackie (Herbert's wife), went home to try and nurse him as best as they could. Mom wasn't well during this period and could do very little to help. In a week or two, we decided that dad could no longer bear the suffering he was experiencing, so we decided to readmit him to the hospital. The doctor in charge of the hospital did not like the idea of dad coming back to the hospital, saying that they had done everything for him that they could and he told Herbert and me that he wanted him out of there. We ignored that remark, and left him in the hospital. Again, the family came together and tried to be with dad around the clock to make sure that they didn't neglect him and let him suffer. Bill and I relieved Marie at the hospital about 11 o'clock on the night of August 3, 1967 to spend the night with dad. We made him as comfortable as possible and settled down for a long night. Dad had been in a coma for a couple of days and of course had no idea that we were there. The night was uneventful until about 5:30 the next morning when dad groaned a little and gasped for breath. I rushed to get a nurse and when I returned, dad was gone. A part of me went with dad that morning. As I turned toward the hospital window and looked out toward Heaven, his entire life as I remembered it, flashed before my eyes and I vowed to record it some day. I don't believe that Noah Smith ever had an enemy or had mistreated any one during the 75 years that he was on this earth. He was my buddy, my teacher, my mentor, as well as the best dad that ever lived. He loved his work, his children, and his wife. He was never arrested for any reason and never had a fight, not even an argument with anyone to my knowledge. Not many men can match that record. Truly, the Giant has fallen. Dad now rests in Roselawn Cemetery in Princeton, West Virginia.